Slow Cooker Chili – Delicious, warm, beefy chili packed with beans, vegetables, and spices, and cooked in the crock pot. EASY, classic Slow Cooker Chili that takes VERY little effort and makes a perfect meal the family will love. You can even switch up the ground beef to lighten up this recipe by using ground chicken or turkey. Special because I can vegetate all day – in my pajamas – and I won’t feel an ounce of guilt about it. Special because I can enjoy my girls without even thinking about the sink full of dishes. (Okay, that’s a lie. I can’t stand it when the sink is full!) 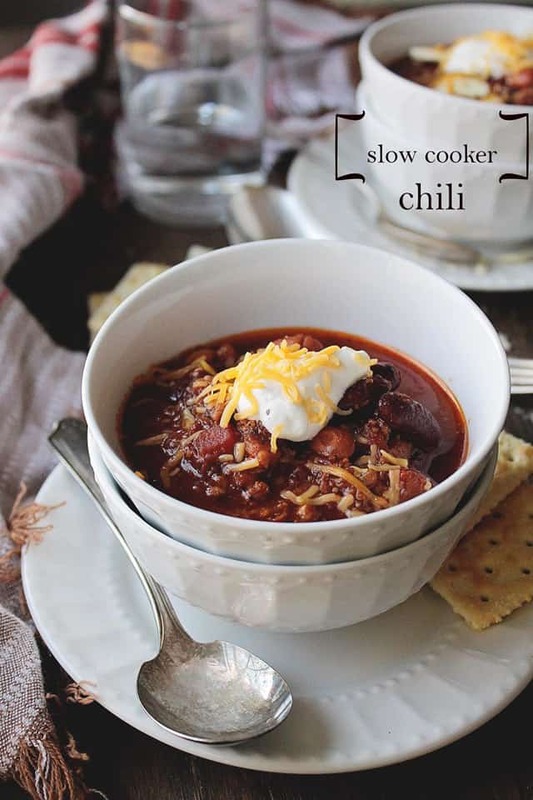 Special because I can throw food into my slow cooker and create a delicious chili. Special because we, our 4-member family, can finally have a meal together. Thank you, Sunday, for being you. P.S. Me thinks you should be 48-hours long. 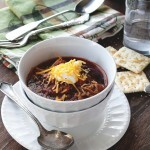 In other exciting Sunday-news, I think I know what you want on this bitterly cold day – Chili. 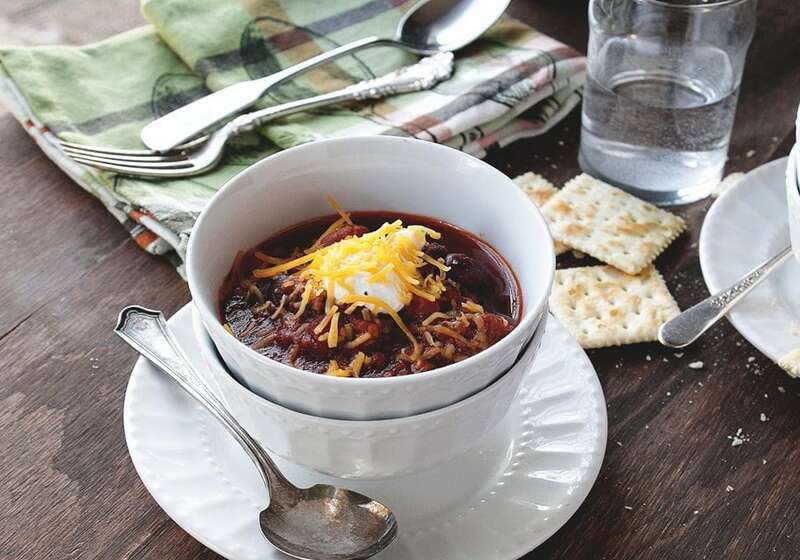 A warm and hearty bowl of slow cooker chili. With sour cream and cheddar cheese on top. Right?! The cold air outside surely isn’t calling for a bowl of ice cream, now is it? But then again, it could be 50-below-zero and I would still opt for a bowl of ice cream. I LOVE that stuff! About that chili. I think I know the secret to a really really good chili – it takes time, patience, and a whole lotta love. Sure you can make this chili in your beautiful dutch oven in an hour or so, but why bother. Just throw it all in the crock pot, put the lid on, and forget about it. Come back in 6 hours and serve. Slow Cooker Chili - Delicious, warm, beefy chili packed with beans, vegetables, and spices, and cooked in the crock pot. Add the onions and cook for 3 minutes, stirring frequently. Stir in garlic and meat; season with salt and pepper and continue to cook until meat is browned. Remove from heat and put the beef mixture into the pot of your slow cooker. Add the rest of the ingredients, excluding the toppings, to the slow cooker pot. Set it on HIGH and cook for 3 to 4 hours, or cook on LOW for 6 hours. Ladle into bowls and top with a dollop of sour cream and shredded cheddar cheese. I think Cinnamon in the chili is great. I added green beans instead of the carrot. And I didn’t find pintobeans here in The Netherlands so I replaced them for limabeans. Excellent recipe! My hubby & I aren’t fans of kidney beans, so I substituted them for just plain old baked beans, and switched the carrot to corn to add a little bit of cruch. Best recipe ever, we were both going back for seconds! So glad you enjoyed it!! Thanks, Melanie, for sharing! I need to work on making good chilis. As my family (minus me) is not into beans, I have been avoiding cooking food with beans (otherwise I’d end up with eating all the beans!). I crave for chilis, and this looks so good – when I come home from a long day of activities etc, I want this to be on the table… ah, nice dish!!! This chili would make me happy- it looks cosy, and happy! Chili sounds really good in this crappy cold weather. I have always thought Saturdays and Sundays are special. I love chilling at home, baking with my mom, and watching movies. I’ll never tire of that. It makes me sad that one day days like that probably won’t be able to happen one day, hopefully way, way off in the future. Oh I love the cinnamon, great idea (so is the throw everything in a slow cooker and forget about it ;))! I’d love a bowl of this right now, Kate. 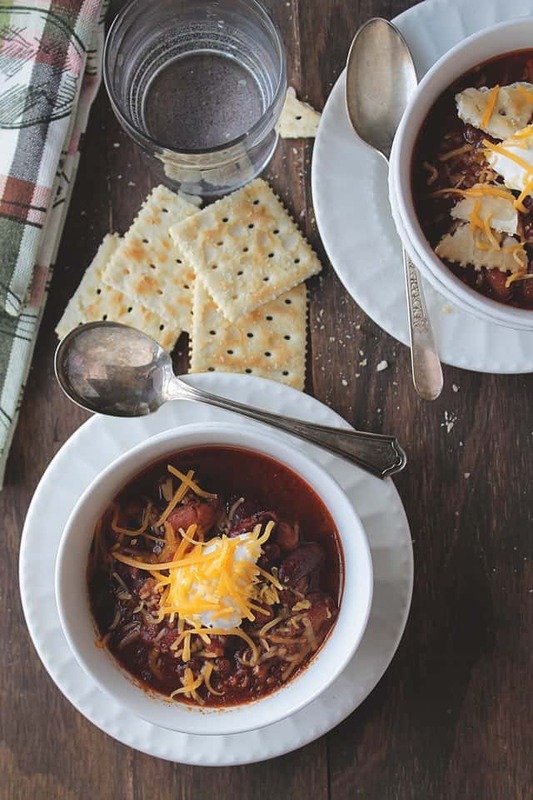 I love Cincinnati chili (with it’s hint of cinnamon) and think that this recipe would be just delicious. I think cinnamon is a great addition to chili! And I’m with you – Sunday should last 48 hours. It goes by just way too fast. Great looking slow cooker meal for this weather too. Delicious! Yum! I think I need a big bowl of this!